Review: About 3 friends living in Reading in the 1970’s. A very enjoyable 70’s film. Even though it is a comedy it is not a film that makes you laugh all the way through. Very few laughs. Ricky Gervais was actually born in Reading. 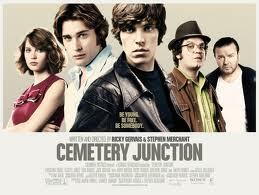 Cemetery Junction is an area in Reading and they actually filmed there. This is Ricky Gervais’s first feature film made on his home soil. Contains strong language.